Hacker-Pschorr | Beer Apprentice - Craft Beer News, Reviews, Interviews and Info. Hello again guys. I hope this beer review finds you in good spirits because today I’m going to be tasting another Oktoberfest. This drink comes to us from Hacker-Pschorr Brau GmbH located in Munich, Germany and it’s called the Hacker-Pschorr Original Oktoberfest. The brewers website, hacker-pschorr.de, was not capable of translating to English, so I looked up the commercial description on ratebeer.com. Bavarian barley slow roasted, caramelized to a rich, red amber color combined with the purest waters from the Alps, exclusive yeast and the finest Hallertau hops. The brew comes in an 11.2 oz. bottle and has an ABV of 5.8%. This beer definitely looked like an Oktoberfest with the traditional clear, amber to copper color combined with burnt orange and yellow highlights shimmering at the bottom and sides of the glass. The cap was of good size, very smooth, creamy and off white in color. The retention time could have been better I thought, but the lacing left behind looked ok. The nose began with the expectant caramel malt. Lightly toasted malts of bread and hints of grain coalesced with touches of spice to add further complexity. Some floral and earthy hops gave it a nice little punch in the aroma. It smelled clean, balanced and even. It wasn’t overly robust or rich, but rather solid and sturdy. The taste followed the aroma very closely with the only difference being that it seemed a little more robust and rich. Stronger aspects of caramel sweetness and much more of the grain bill presented themselves on the tongue. The spice was about the same as was the breadiness and the toasted malts. It relayed a very mild bitterness by way of the earthy hops and the flavor was very “round”, clean and proper. The mouthfeel was medium, smooth, crisp, snappy and dry. This brew actually became quite refreshing the longer I sipped. It left a good coating of flavor on the palate also. Not bad. I’ll tell ya. After having the fortunate opportunity to taste so many Oktoberfests at this time of year I begin to get a bit fatigued with them. They all start to taste the same and I have a hard time distinguishing one from the other. With that being said, this beer stood out to me. I’m not a huge fan of Marzen style beers, but the Hacker-Pschorr Original Oktoberfest is one of the best that I’ve tried this season. It’s a very good brew. It’s quite a bit more forthcoming and robust than most of this style seem to be, yet it remains very drinkable and fitting for the season. I found it to be perfect for the crisp evening on which I tried it. If you guys haven’t partaken in this particular brew yet, I would encourage you to do so. Again, I don’t tend to rate this style very high, but I would have no problem drinking this one again before the season is over. As always, thanks for reading and commenting folks. Be sure to take a look at my profile on Google+ (Scott Shrewsberry) and follow me on Twitter (@BeerApprentice or @shrews824) if you would like. I love engaging in great craft beer talk. How’s everyone doing? I hope all is well. I thought I would take a few minutes and write another craft beer review for you guys if that’s ok? 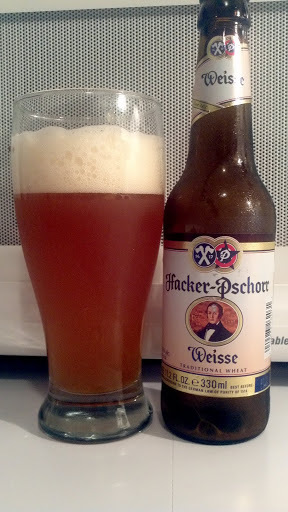 I’ve decided to share with you my tasting experience of the Hacker-Pschorr Weisse produced by Hacker-Pschorr Brau GmbH from Munich, Germany. I’ve heard many good things about Hacker-Pschorr, however I have never tried anything from them, so I’m looking forward to this review. Here’s the commercial description from the website, hacker-pschorr.de. Brewed with 60 percent wheat, 40 percent barley – using top fermenting yeast, it is then slowly lagered and remains unfiltered throughout the finish. The Hacker-Pschorr Weisse comes in an 11.2 oz. bottle and has an ABV of 5.5%. The brew poured a cloudy, deep orange color with burnt yellow highlights throughout. The crown was large, off white, fluffy and somewhat creamy looking. The retention was decent and the lacing was very good. It looks pretty nice in the glass I must say. Within the nose I found a sufficient aroma of fruity banana with well proportioned spices of clove and light pepper. Wheat fragrances were noted, although they stayed moderate and mild mannered. A nice bouquet here. Well balanced and straight forward. The flavor revealed the ever present banana along with the aforementioned spices of clove and pepper. More wheat and yeasty characteristics were found coinciding with savors reminiscent of light crackers and white bread crusts. The taste was very pleasing. No frills here. The mouthfeel was medium to medium/light. Dry, smooth, crisp, refreshing and thirst quenching with some very good carbonation. A very good dose of flavor was left behind, especially the spices. For me, this is one of the better Hefeweisse beers I’ve tried. It’s very solid, very well made and truly fits the style. Totally sessionable and easy to drink. I would recommend giving it a try while the weather is still warm, although I think this could also be enjoyed on into the Fall season. Even though this particular type of beer is not a favorite of mine, I don’t think that I would hesitate to pick this up or turn it down if it was offered. I’m much better off having tried it. As I’ve said many times before, I really appreciate everyone reading and commenting on the posts. I hope you are finding them helpful and/or informative. Please feel free to critique them if necessary.